15642 Dove Meadow, in Deerfield, is ready to meet it’s new owner. This 2 story home sits on just under quarter acre lot and boast 3217 sqft with 4 bedrooms, 3 1/2 bathrooms and a 2 car garage with finished poxy floors and workbench. The beautifully landscaped front yard, 3 sided brick exterior, and grand covered front porch all come together to create the homes fantastic curb appeal. You are greeted with an impressive entrance, featuring an abundance of natural light, ceramic tiled flooring and the desire to see more. Just off the grand entrance you will find a large study and formal dining room, both featuring natural light, crown molding and custom shutters. As you make your way to the chef’s kitchen, you won’t be disappointed, featuring corian countertops, a deep undermount sink, an endless amount of cabinet space, the perfect island for entertaining, and a bright breakfast room with a view! Opening into the huge living room you will notice the hardwood floors, tray ceilings, and a floor to ceiling bricked gas fireplace. The master suite is located on the 1st floor, just off the living room. The master bedroom provides plenty of space, natural light, over 10 ft ceilings, and an incredible on suite bathroom, featuring ceramic tile flooring, his and her vanity, a huge walk in closet, a tiled walk-in shower including a sitting bench and beautiful window bringing in natural light. Plus, a relaxing jetted garden tub with ceramic tile backsplash. Upstairs there are 3 additional bedrooms each with their own unique trait. The largest room provides a walk-in closet, tray ceilings, and it’s own full bathroom featuring a single vanity with storage, and a tiled tub/shower combo. The 2nd bedroom offers a vaulted ceiling, a large beautiful window with custom shutters, a built in desk and access to the spacious guest bathroom. The bathroom features a single vanity, additional counter space and a tiled tub/shower combo. The 3rd bedroom is just the right size with a spacious closet and close proximity to the guest bathroom. Upstairs there is one more surprise, an additional living area, which can serve as a game room, media room, play room, or a 5th bedroom. It features 10 ft tray ceilings, natural light and 2 large closets. The backyard oasis, is perfectly landscaped with multiple mature trees and backs up to a sizable greenbelt. The covered deck patio features a custom awning providing plenty of shade. There is also a grill area with a river rock patio all perfect for relaxing or entertaining. This home offers even more, it’s fully equipped with a central vacuum system, water softener, reverse osmosis system, irrigation system front & back, and a community center including a playground, tennis courts, a basketball court, olympics style pool, club house, and a near by dog park. 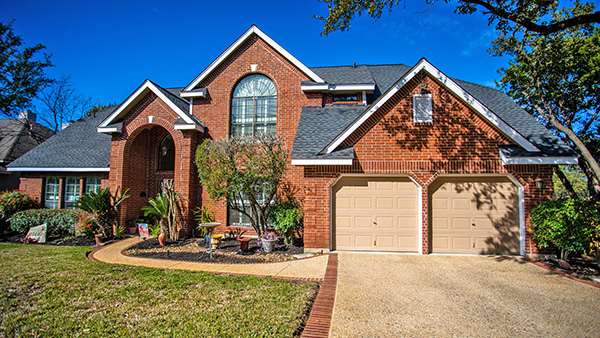 Last but not least, the Deerfield neighborhood has access to highly rated schools, fine dining, multiple golf & country clubs, major services and is also patrolled 24/7 by off-duty SAPD officers. For more information, contact one of our REALTORS today!